It’s 2018. Coaches have access to spin rates, horizontal break, and percentages of pitch types thrown in specific counts at the collegiate and professional levels. It’s time we stop telling pitchers to “pound the knees”. It’s time we stop calling every over-the-top breaking ball a 12-6 curveball. Data is here. Some of these statements are outdated and blatantly incorrect when advising a pitcher. It’s not going anywhere. With products like Rapsodo, we have the ability to fully design and develop a pitcher’s arsenal. What is Rapsodo? Rapsodo is a pitch tracking device that analyzes spin rate, velocity, movement, command, and provides the ability to break down mechanics. It provides immediate feedback on every pitch along with bullpen reports to analyze data from each training session. Speed is king for all levels of baseball. There is no hiding behind this. Don’t believe it, go to a middle school game. Then go to a high school game. What changes? The speed of the game. Running, throwing, and bat speed all become bigger factors as you move to the next level. Scouts bring 3 things to a game; something to write on, a radar gun, and a stopwatch. You must check off boxes to gain attention from scouts and most of them come from a radar gun and a stopwatch. "Throwing strikes and creating hard contact in the batter’s box is always going to be important, but bat speed, throwing velocity, and foot speed are still king." Throwing velocity is the most important tool in the tool box. The other two most important pieces for pitchers are command and movement. You need to have at least 2 of the 3 to stand a chance being successful at the next levels. Velocity doesn’t solve all of a pitcher’s problems, but it is a very important box to check off for scouts and recruiters. When developing the other two pieces, Rapsodo becomes a critical measuring tool for pitchers. We are in an era where pitchers are throwing 90+mph off-speed pitches with elite horizontal and/or vertical break. For example, Blake Treinen is throwing 96-100mph sinkers that look like a left-handed pitcher throwing sliders. These major league clubs are utilizing pitch tracking data to maximize velocity and movement to create weak contact. Below is information on what pitch tracking means, how to digest it, and most importantly how it can maximize your success in-game. What does Pitch Tracking mean? Pitch tracking data comes from different tools like TrackMan, Rapsodo, FlightScope, and Diamond Kinetics that provide different metrics for every pitch thrown. Some only track spin rate, movement, and/or velocity. Most major colleges, almost all MLB clubs, and higher end training facilities have products like Rapsodo to use for off-season, spring training, and throughout the season. TrackMan is in several Division 1 stadiums as well as every MLB stadium. This data gets crunched by employees and companies such as BaseballSavant. Data analysts, coaches, and pitching coordinators are using this data to digest performance along with enhancing pitch design, pitch development, and pitch usage for their players. 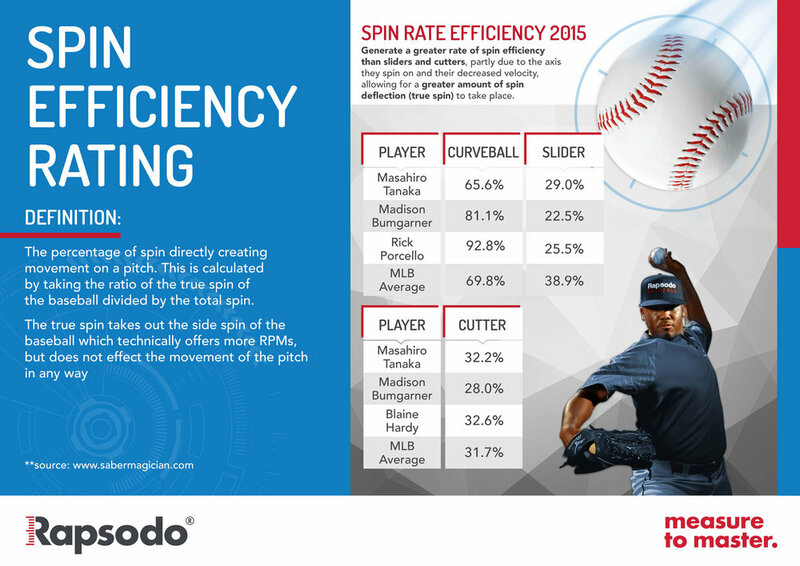 More data below in this article shows different spin rates for MLB Pitchers. Rapsodo has provided a product that allows us to measure everything about a pitch including velocity, spin axis, spin rate, spin efficiency, and movement while supplying reports to analyze for coaches and players. See below (Image 1), you can identify your pitches, track your velocity and command, and work on creating the best movement for your pitch arsenal (Image 2). In Image 1, the charts on the bullpen report show strike percentage for different pitches along with horizontal and vertical break of every pitch. This small sample size of information is from one short bullpen that shows what is being done with the Cutter. Without this immediate feedback, pitch design becomes much more difficult to match the pitcher’s feel along with data. The Cutter shows it is moving on two different planes with little horizontal movement from spin. Two of the biggest factors are finding the consistency with axis and spin efficiency. Several key things can be abstracted from this data to apply to pitchers of all levels. The conversation between coach and player becomes much more supported by information rather than guessing. Trial and error is ultimately the best route to designing a pitch. If all we are relying on is the naked eye and video, then our rate of success will suffer. Rapsodo can be used for all ages and skill levels, but should be a priority when working with higher level athletes who are wanting to maximize pitch efficiency. Movement being one of the key factors in pitch ability, you can get a full breakdown of your pitch arsenal in each bullpen. Now, how do we use the data? Rapsodo does a great job of supplying data. But the data means nothing without considering all factors. Pitchers generate spin and movement thanks to several variables such as delivery mechanics, slot, intent, grip, pressure distribution among fingers, etc. Just because Cy Young winners produce “x” type of spin rate does not mean you should aim to match. Numbers are different and unique to each pitcher. Your individualized skill set can be maximized in a completely different way than your peers. For example, we know that a high spin rate fastball should be used in the top of the strike zone. It fights through gravity better which can is maximized at top of zone (Magnus Force). A low spin fastball should be kept down in the zone as gravity will drive that pitch down and produce more ground balls. With breaking balls, a heavy spin curveball with high efficiency can create heavy tilt and depth. A high spin, low efficiency (below 60%) will have less vertical break but could produce more horizontal movement depending on the axis. A slider from a low ¾ slot with low spin and efficiency will feature more depth from the gyrospin which can produce a high swing and miss rate. A high ¾ slot slider with heavy spin and low efficiency can produce the same result despite different grip, slot, and axis. Point is, don’t aim for a “goal” on spin rate, axis, or efficiency. Collect data and analyze what is best for your delivery, grip, slot, spin, and tunnelling off of your other pitches. "Every pitcher is an artist." How you create your final product can be done in many ways with success. The goal needs to be that it is a repeatable, natural delivery with confidence to maximize soft contact or swing and misses. With all of the data collection in the MLB these days, we can start to digest the importance of velocity, spin rate, movement, and the results they produce. Data shows that there are several outliers and differences between results and spin rates. "We know that there is not one single way to develop more spin rate (legally), but there are ways to maximize pitch success within a pitcher’s current capabilities with spinning the baseball." The average spin rate for a fastball in 2016 was 2264rpm in the MLB. These examples show different spin rates that accomplish the same goal. The efficiency, axis, and slot are what is most important and make the biggest impact on the pitch movement. It’s easy to say that maximizing spin rate can better a pitch. When discussing breaking balls, that could be true when predicting the ceiling of a pitch. But to keep it simple, the goal is to manipulate the baseball with spin and movement. How you accomplish that can vary from subject to subject. Image above (Image 4) shows that an increased spin rate and velocity can correlate to a higher swinging strike percentage. Yes, higher fastball velocity leads to more swinging strikes. Image 4 shows data proving that higher spin rates combined with velocity usually equal more swinging strikes as well. Velocity and spin rate are also somewhat correlated. Typically a spin rate will climb with the velocity of the pitcher. Average RPM’s vary at all age levels along with velocity. With the MLB average being 2264 in 2016 on the 4-seam fastball, this provides a general baseline for how pitchers should attempt to control the zone. High spin rate fastballs should be utilized in the top of the strike zone. Low spin rate fastballs should be utilized in the bottom of the strike zone. Those aren’t absolutes, but in general it provides a common approach that leads to weak contact. Typically, identifying a low spin rate on a 4-seam fastball leads to designing a 2-seam fastball to utilize less true spin and creating even more kill on the vertical break. Driveline Baseball posted a Blog in March of 2017 about Bauer Units. This equation provides coaches of all levels easier ways to compare data whether you are a big leaguer or a 14u pitcher. The MLB average was 23.9 Bauer Units. For example, a 72mph fastball at 1750RPM would be 24.3 Bauer Units (Driveline Baseball). When assessing younger athletes or lesser velocities, the Bauer Units formula is a great tool to truly assess where a pitcher stands in comparison to others. This clears up a lot of misunderstandings when working with mid-80’s HS/College pitchers with spin rates around 2,000. A pitcher throwing 84mph at 2100 will have 25 Bauer Units. This information and formula is very important when using Rapsodo for younger pitchers. How do you design it? Knowing your spin and axis is step number one. Once you know, it becomes a trial and error process. Adjusting grips, wrist angle, pressure on fingers, and thumb placement are just a few to mention. Each pitcher has different hand and finger size. It takes time and a lot of repetitions. Pitchers must be able to “feel” release and the adjustments on the spin when learning how repeat a pitch. Inconsistent data on Rapsodo is very common when trialing a new grip or pitch. An inconsistent pitch in a bullpen setting is a set up for failure in game when it comes to pitch execution. There are several ways to drive pitchers towards feeling differences in grip, pressure and release. Making too much of a change one way or another will make it very difficult to find a comfort zone for the pitcher. Know your data? As mentioned before, this alone is critical to understanding where and how you should be using your arsenal. If you are a high RPM or Bauer Units 4-seam Fastball pitcher, you should be working up in the zone. If you are in the “average” category, you should trial with some adjustments in grip, pressure, and assess your 2-seam spin rates. Below average spin rate, you should be working in the bottom of the zone. "Most pitchers have never been told to work up in the zone due to the misunderstanding of pounding the knees having a correlation to success. " If want to throw a harder, higher spin rate off-speed pitch, stay in the middle of the ball longer. Resisting early hand torque or “fall off” can create a higher velocity and/or spin rate. Keep it simple, think fastball longer. Move your fingers closer together on 4-seam and 2-seam. Several pitchers create a cut action on the baseball as fingers being setup wider on the baseball allows middle finger to pull the side of baseball. Try pressuring different fingers. Emphasize the middle finger more on a slider than a cutter. Emphasize the pointer finger more on 2-seam and sinkers. Move the thumb! The thumb does a lot to affect spin. Notice different movements and spins on change-ups, sliders, cutters, 2-seam, 4-seam when tucking the thumb. Collect video! Must match what you see with what you feel. Slow-motion video of behind the throwing hand will allow you to see what you may or not feel causing the results of the pitch spin and movement. Be open to suggestions. Not one way works for just one guy. Don’t give up on a new grip or pitch just because you fail the first few reps. These are just a few staples in developing a new pitch with or without a pitch tracking device. When using a Rapsodo in the bullpen, you can get immediate feedback whether or not moving grips or pressure changed anything with the pitch result. One of the biggest successes that I’ve personally had with teaching new grips and pitches is the change-up. Often, pitchers try to create too much pronation or have a grip that doesn’t allow the ball to spin with intent. Pitcher’s want to slow their arm action to ensure lower velocity than fastball. The change-up grip should be something that can be thrown with intent and comfort. The grip and axis will do the work while the delivery and the arm action should think fastball. The goal is to create an axis that produces lower efficiency than the fastball. This will kill velocity, create depth, and horizontal break. Typcially, this means a true spin of about 500-800 less than the pitcher’s fastball. Grips vary between pitcher’s mechanics and arm slot, but a common cue I personally use is throwing the the thumb and middle finger through the catcher’s mitt. This can motivate the pitcher to create later pronation and enhance intent. Again, this is just one example but have found success with pitcher’s at different levels. Designing and gaining feel for a new pitch is a love/hate relationship. It can take several bullpens before even getting a feel for the new grip or hand positioning. Goal number one is to get comfortable with it just throwing with a catcher. This can take a while. Recommendation, add it more to your catch play when prior to bullpen. Step two, have a hitter stand in provide feedback. Step three, live at bats with data collection and video analysis to see the translation from bullpen setting to live. It is common for pitch data to change from the bullpen setting to live ABs due to adrenaline and intent. Collecting that feedback along with batter results can provide very important information that shows the true impact of the pitch adjustment. Now, go back to the lab and see how results transferred over to live. If data wasn’t consistent, get back to work in a controlled bullpen setting. Before getting into much change with pitch design, a personal suggestion is to tell the pitcher he has to strike out an elite hitter with his best stuff. Now, collect video and watch. Get a feel for the pitcher does when just trying to produce a filthy pitch without more external cueing. Go to work from there once you have data from Rapsodo and slow-motion video of delivery, grip, and hand positioning. Take Bauer Units, spin axis, movement, and success rates into consideration before breaking down a current pitch. Having technology such as Rapsodo or Trackman and high-speed video cameras can separate your pitch development from the competition. The ability to digest the data and make necessary adjustments without over-coaching it is an art that is often misunderstood. By all means, pitches have been designed for well over a 100 years now but the ability to do so with immediate feedback outside of the “eye test” can expedite the process very quickly and efficiently. Throughout a pitcher’s development, pitch design always remains key piece. Understanding the information on spin rates, movements it can cause, and how to utilize in your pitch sequencing are all important variables. Proper coaching and use of the data can separate pitchers from their peers. For more information or data, contact PRPBaseball101@gmail.com.